The original Wovin Wall system was developed by Box and Dice as an interior solution for the exclusive Longrain restaurant in Sydney. After some continued design work the wall easily lent itself to efficient ongoing production. Wovin Wall bears a multitude of awards including Australian Design Mark (2002) for the original design and many environmental accolades for its acoustic benefits. The Wovin system is now in full production, being distributed in partnership with InStyle globally and through 3form in the US. Wovin Wall is now a company that designs, develops and produces an extended range of interior products. 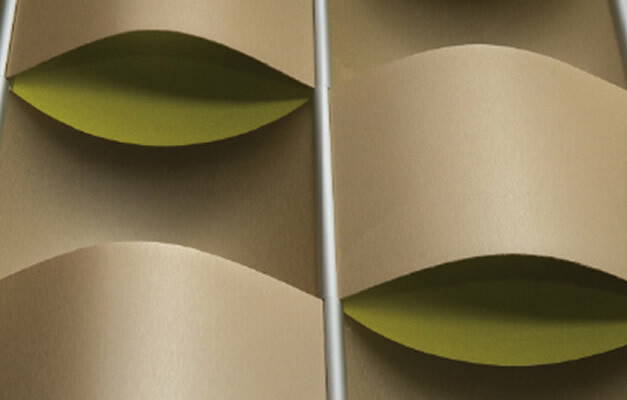 The most recent design by Box and Dice for Wovin is ‘Ripple’ which, won the gold award at the 2011 Neocon Exhibition in Chicago (exhibited by 3form).